I downloaded this for free from iTunes awhile back as I had read Coelho's The Witch of Portobello and had really enjoyed it. 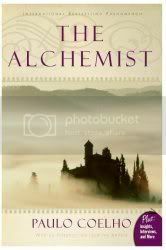 The Alchemist is the story of a boy's journey of discovery, following omens and spiritual messages to discover his destiny. Maybe I'm just reading this at the wrong time, but I didn't get as much from this story as I thought I would. It has had such a grand following, I was feeling really good going into it, but I felt the message was presented a little too up front. Not a bad book, just a bit too didactic for my liking.